As you can see we have a new look to our website. Please help us by notifying us, if you have any problems viewing or using the site. Here is an important announcement: The Park Savoy Hotel has been reserving rooms for the Fest. The reservation period will expire soon! Next Tuesday is the last day that you can be sure to get the special rates that are posted elsewhere on this site. If you want to reserve one of these rooms, you should do it now. All of a sudden, there is energy and excitement about the Fest. Winter doldrums are gone and people are looking to become active. The Uke Fest is a great choice for coming out of hibernation. I got an email from a parent asking if the Fest was suitable for bringing his young children. I said that this year, in particular, is especially appropriate for young people. Our headlining act, the Langley Ukulele Ensemble is composed of teenagers, Ryan Nakagawa, an ukulele prodigy, is only 11 years old and Amelia Robinson performs as “Mil’s Trills” for children, (as well as for adults under her own name.) Just so we don’t get type-cast, Khabu has arranged to bring a bus load of his senior students of the uke, so we will run the full gamut. Some of us will be gathering at Church for All Nations on Friday evening for an ukulele event. We will be hosting the monthly Ukulele Meetup. This will serve as something of a “shakedown” cruise for the film screening, which will take place in the same location a few weeks later. Practice makes perfect! Tony Coleman will be coming down to the Fest and we have also added Ritchie’s Music Store as a vendor. Finally, I want to repeat the fact that we are giving away a fine Kala tenor uke at the opening bell on Friday, June 8, between Noon and 1PM. You have to be there to have a chance at it, so join us! We have just about one month to go until the 2012 NY Uke Fest. We are still making additions to the lineup. Hisako Sekiguchi san knew how much I wanted to bring Ryan Nakagawa to last year’s Fest, but it proved impossible. Somehow, she was able to arrange this for us this year! Ryan is an amazing ukulele prodigy, who at 11 years old, is already attracting the attention of the ukelele community. Ryan and his mom will accompany Hisako san for Ryan to perform at this year’s Fest. Wait until you see this amazing player. We also expect a return visit by Nico’o from France. Nico’o will illuminate the flamenco style of playing that was so inspiring in his past appearances. Welcome back, Nico’o. In order to encourage a good turnout for the opening of Fest at Noon on Friday, we are going to give away a beautiful Kala tenor ukulele (with case) within the first hour on Friday! From among the attendees who are present (between 12 and 1PM), we will pick a lucky winner, so get there early for your chance at this uke. We have a very busy month ahead to get ready for the annual event. The sound system is on our minds now and we will be doing a shakedown sound check to prepare for June. This is always challenging because we have such a wide variety of acts. This year the range will be particularly broad, with solo acts all the way up to an 18 piece Ensemble (Langley Ukulele Ensemble). WE love the quick change between acts and we can’t get in the way of our dancers! This month we are also engrossed in promotion. We want to get the word out as much as we can. Thanks you to all of you helping us in this and we ask you to continue talking the Fest up. It must be working. We have been contacted by a major TV network and they are planning on sending a film crew to cover the Fest and use the footage on their nightly news closing portion with up to 9 million viewers! Exciting! Let’s make sure there is a full house in attendance. Welcome to our new website! Please let us know what you think and give us suggestions on how to improve it. See you next month. We are all hard at work preparing to host the 2012 NY Uke Fest. With the June-like weather we have had all week here in New York, it reminds us of how close this year’s Fest is! Just two months away . . .
What have we been doing this week? Jeff is busy with vendor arrangements. With several interesting prospects, the latest table addition is Tony Coleman’s Mighty Uke. Tee shirts, videos and other items for sale will help to continue the saga of this documentary film we all love so much. Tony will also be offering a workshop. Speaking of which, Marie has rounded out the complete list of 30 workshops and it is now posted. This is not to say it is written in stone. There are bound to be changes and adjustments, but we now have these workshops to start with. In the near future, we will post a description of each workshop. Myself, I was occupied with promoting the Fest, especially in New Jersey this weekend. As many of you know, Jake Shimabukuro played in Newark on Saturday and in Camden on Sunday. 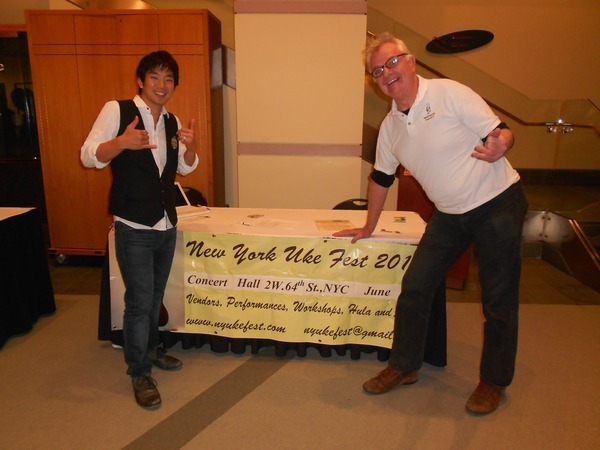 As a reward for supporting Jake’s concert, the NY Uke Fest was given a table in the lobby of NJ PAC to advertise our Fest. Since so many uke players attend Jake’s concerts, it was a great audience for us to reach. Being at Jake’s concert over the weekend reinforced the conclusion that there is a viable ukulele community! Hundreds of people lined up patiently, many carrying their ukes, to speak to him after his performance, which by the way was spectacular. There is a real craving for ukulele. The NY Uke Fest is one of the primary ways to satisfy this urge. It is a four-day celebration of everything to do with the ukulele. A huge amount of work goes into arranging this one weekend. Performers are preparing and rehearsing their sets, workshops are being developed, sound system checked and re-checked, luau, hotels, flights, graphics, ads, etc. etc. Your job is to make sure you are clear to attend and bring your ukes. We are all hard at work preparing to host the 2012 NY Uke Fest. With the June-like weather we have had all week here in New York, it reminds us of how close this year’s Fest is! Just two months away…. Myself, I was occupied with promoting the Fest, especially in New Jersey this weekend. As many of you know, Jake Shimabukuro played in Newark on Saturday and in Camden on Sunday. As a reward for supporting Jake’s concert, the NY Uke Fest was given a table in the lobby of NJ PAC to advertise our Fest. Since so many uke players attend Jake’s concerts, it was a great audience for us to reach. See the picture I included below of Jake at our table.